Organohalide-respiring bacteria are generally sensitive to pH. Reductive dechlorination of tetrachloroethene (PCE) to trichloroethene (TCE) and then to cis-1,2-dichloroethene(cDCE) can occur at a pH as low as 5.5. However, rates of cDCE reduction to vinyl chloride (VC) and then to ethene are reduced below a pH of 6.0. For efficient dechlorination to non-toxic end products, aquifer pH should be maintained above 6.0 during enhanced reductive dechlorination (ERD). Adaptation of a Dechlorinating Culture, KB-1, to Acidic Environments. Organohalide respiration with chlorinated ethenes under low pH conditions. Enhanced reductive dechlorination (ERD) is commonly used to treat chlorinated solvents and related contaminants in groundwater by providing a fermentable organic substrate to serve as both an electron donor and a carbon source to stimulate microbially mediated reductive dechlorination. During ERD, the pH may decline as hydrochloric acid (HCl) is produced during reductive dechlorination  and carbonic acid and organic acids are produced by substrate fermentation. However, dechlorinating bacteria appear to be particularly sensitive to pH changes with dechlorination of cDCE and VC to ethene completely inhibited at a pH of 5.5, resulting in a significant decline in degradation rates. Many biological processes are sensitive to pH. Most microorganisms important for subsurface bioremediation function most efficiently in near neutral conditions. Low pH can interfere with pH homeostasis or increase the solubility of toxic metals. Microorganisms can expend cellular energy to maintain homeostasis, or conditions in the cytoplasm and periplasm may change in response to external changes in pH. Some anaerobes have adapted to low pH conditions through alterations in carbon and electron flow, cellular morphology, membrane structure, and protein synthesis. Table 1 shows the range and optimum pH for growth of bacteria that reduce PCE to TCE and cDCE. Zhuang and Pavlostathis (1995) found that neutral pH was optimum for reductive dechlorination by a methanogenic mixed culture capable of dechlorinating PCE to VC. Vainberg et al. (2006) reported an optimum pH of 6.0-6.8 for dechlorination of PCE by the SDC-9™ bioaugmentation culture. Dechlorination of PCE and TCE to cDCE can occur at pH down to 5.5.
where Rmax is the maximum dechlorination rate at the optimal pH (pHopt), and n and σ are empirical fitting parameters (Table 2). Graphs of relative dechlorination rates (RpH / Rmax) are shown in Figure 1. Dechlorination of PCE to cDCE can continue at pH below 5.5. However, dechlorination of cDCE to VC and VC to ethene is severely inhibited below a pH of 5.5. Figure 1. Relative Dechlorination Rates (RpH /Rmax) versus pH for Consortia SL2-PCEa, SL2-PCEb, AQ-1, and PM (adapted from Lacroix et al. 2014). Multiple researchers have attempted to develop enrichment cultures capable of complete dechlorination of PCE and TCE to ethene at low pH. However, to date, these attempts have had only modest success. Rowlands (2004)  reported that the KB-1™ bioaugmentation culture has an optimal range of 6.0-8.3 and is completely inhibited below pH~5.0. Li (2012) found that rates of VC reduction to ethene by a KB-1 culture declined by a factor of two as the pH was reduced from 7 to 6. Ethene production rates declined slowly over time and multiple degradation cycles. The decline in ethene production rates was accompanied by a decline of Dehalococcoides (Dhc) numbers, increase in methanogens, and a shift in total electron equivalents consumed, from dechlorination towards methanogenesis. In methanol fed pH 6 cultures, ethene production rates slowly increased over hundreds of days, with one culture showing sustained VC dechlorination at pH 5.7 (Li, 2012). Using a bioaugmentation culture enriched from Savannah River Site aquifer material, Eaddy (2008) found that dechlorination of PCE and TCE slowed at a pH of 6.0 with increased accumulation of cDCE and VC. At pH 5.5, reduction of cDCE to VC and VC to ethene was completely inhibited. Yang (2017a) found that various dechlorinating pure cultures and the BDI consortium showed the highest dechlorination rates at circumneutral pH. Sulfurospirillum multivorans was the only organism identified that dechlorinated PCE to cDCE at pH 5.5. Yang (2016) and Yang et al. (2017a) found that only one enrichment culture containing Desulfovibrio, Sulfurospirillum and Megasphaera showed dechlorination of PCE to cDCE after repeated transfers at pH 5.5. After 40-days exposure to pH 5.5, Dhc lost the ability to dechlorinate VC to ethene (Yang et al. 2017b). 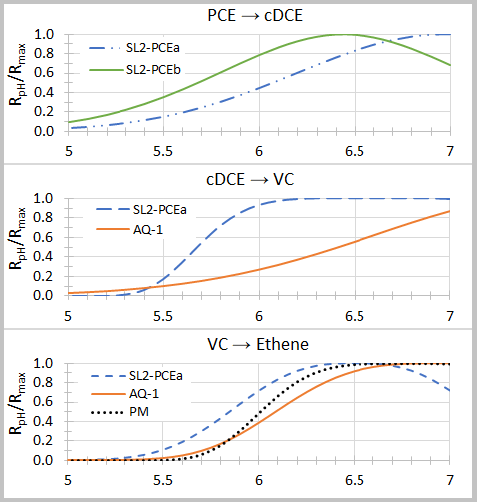 Overall, these results indicate that: (a) dechlorination rates are highest at circumneutral pH; (b) certain microorganisms can grow while dechlorinating PCE and TCE at pH values of 5.5 and lower; and (c) some Dhc-containing consortia can dechlorinate cDCE and VC to ethene during short-term exposure to pH 5.5. However, at pH 5.5 the consortia do not grow and gradually lose their ability to dechlorinate VC to ethene. As a result, complete dechlorination to ethene will be inhibited at low pH. Several research groups are continuing to work on development of improved enrichment cultures that can be effective at low pH. Acids are produced during ERD that can cause pH to decline, inhibiting further dechlorination. Reduction of PCE to TCE to cDCE can occur at pH down to 5.5 or possibly lower. However, rates of cDCE reduction to VC to ethene are reduced below a pH of 6.0. For efficient dechlorination to non-toxic end products, the aquifer pH should be maintained above 6.0 during ERD. ^ 10.0 10.1 Vainberg, S., Steffan, R.J., Rogers, R., Ladaa, T., Pohlmann, D. and Leigh, D., 2006. Production and application of large-scale cultures for bioaugmentation. Proc 5th Internat Conf Remediation of Chlorinated and Recalcitrant Compounds, Monterey, CA, USA. May 22-25. Paper No. A-50.